Speaking of basketball players giving their opinions on other athletes, Charles Barkley is now questioning Tiger Woods’ behavior. He called the firing of caddie Steve Williams “the last straw,” and wondered why Tiger hasn’t spoken to him in two years. Barkley said he hoped it wasn’t because of that one time when he introduced Woods to 25 prostitutes and ruined his life. Casey McGehee hit three home runs to lead the Milwaukee Brewers’ to a 10-5 win over the St. Louis Cardinals. In honor of his heroics, everyone at Miller Park ate three giant bratwursts and had three tiny heart attacks. Rodriguez, who usually keeps his nose pretty clean, might be suspended for taking part in illegal poker games. At least one of the games allegedly took place in Beverly Hills, and another allegedly featured a near-fight. As if his participation wasn’t enough, reports indicate that every time A-Rod was dealt the suicide king, he made everyone uncomfortable by crying. The Atlanta Braves topped the Washington Nationals 6-4, and Dan Uggla went 2-for-4 to extend his hitting streak to 25 games. This just confirms what Uggla’s father has told him for years: he ain’t half the man DiMaggio was. Matt Garza threw seven innings of scoreless ball as the Chicago Cubs beat the Pittsburgh Pirates 1-0. The Pirates are now below .500 for the first time since June 21, which coincidentally is also the day when a sad Pittsburgh child found a genie and wished for six weeks of happiness, some penny candy, and a day off from the steel mill. Roy Halladay toiled through seven innings to earn his 14th win as the Philadelphia Phillies trumped Colorado Rockies 8-6. 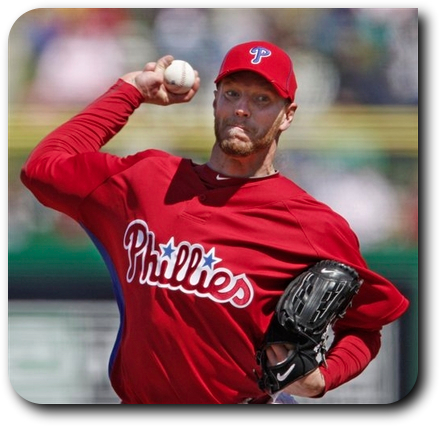 Even though Halladay looks like an old gunfighter and EVERYONE would love it, he still didn’t run around the field firing two pistols into the air after the last out.